What’s new for remarketing this year? Remarketing setup has gone through many guises during its lifetime. There was a time only a few years ago when you had to generate a different tag for each audience list you wanted to create. Since then, things have moved on significantly. Custom combinations tags, the advent of RLSA (remarketing lists for search ads), similar audiences, and then finally remarketing through Google Analytics. While GA remarketing has been available for some time, most advertisers have only recently began to realise the opportunities this presents beyond ease of set up. You’ll still see many advertisers that haven’t gone beyond ‘visited but not converted’ lists despite the huge targeting potential offered by GA remarketing. You can create lists based on anything from screen resolution size to language, and can therefore use these to create search remarketing segments in AdWords to create any bid adjustment you like. Admittedly, the in-built bid adjustments (location, day parting, etc) still have an edge in that all the new remarketing bid adjustments will only be for returning visitors, but it is still a great way to get a competitive edge. If one particular screen resolution is resulting in traffic with a particularly poor conversion rate, then apply a large negative bid adjustment on this list to reduce the traffic coming back from users returning on these devices. If you think outside the box a bit, you can even work around the restriction of ‘no fewer than 1000 members’ for an RLSA list. Will we see feed optimisation become essential to Shopping Campaigns? For the last four years, one of the biggest trends has always been the growth of Shopping Campaigns. One of the biggest changes came back in 2014 when Google changed the structure of product listing campaigns (PLAs) into Shopping Campaigns. Since then, the big changes in the landscape have come from the advertisers, who have looked at ways to gain competitive advantages by optimising what lays at the heart of PLAs – the product feed. We’ve seen huge improvements from our feed optimisation service, and many clients are starting to see this as an essential piece of their Shopping strategy. Feed optimisation tools which dynamically optimise the base feed for different channels will be crucial. 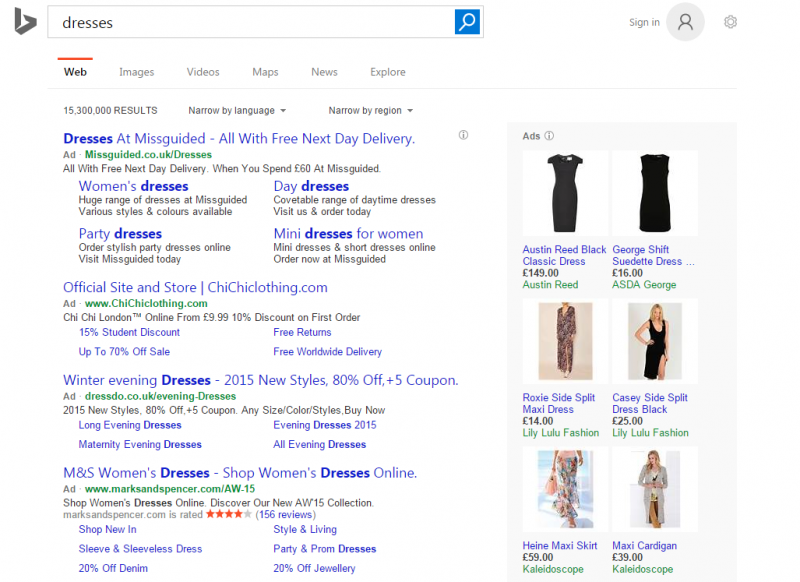 As Bing Ads has thrown its hat in the ring with their new product listing offering, and the potential for expansion into eBay and Amazon feeds, this all highlights the opportunity for advertisers who have a feed optimisation solution going into 2016. As Bing and Yahoo begin to go their separate ways, what have each got up their sleeve in terms of search offering? They have both been striving to differentiate themselves and become indispensable parts of a marketer’s search strategy in their own right. Bing has been doing this through the launch of its product listing ads. Yahoo, meanwhile, has launched its Gemini service. Yahoo Gemini in the UK is a display offering that utilises native ads. We have seen a lot of success with this new ad format, but we anticipate the big news will the launch of Yahoo Gemini’s search offering. It is currently available in the US, and is one to definitely look out for in 2016. Will 2016 be the year advertisers get closer to the perfect model of attribution? It would be naïve to believe that the age old attribution problem will be cracked once and for all any time soon. The issue is that there is no one-size-fits-all attribution model. Every business will want to place different attribution at different points in the customer’s path to purchase. Or indeed, as we discussed in a previous blog, we may want to decide how to attribute based on a visitor’s various sessions with a site, regardless of whether they convert in the end or not. What we do expect to see strides in though, is advertisers getting closer to answering the question of how best to attribute for their business. The alternatives are resorting to arbitrary decisions on how best to attribute or, even worse, seeking out the unattainable holy grail of the one-size-fits-all attribution model. The way in which we expect advertisers to do this is again through GA remarketing. One of the segments you can use to create a list is source/medium. By creating a list of, say, previous visit was through source/medium = google/organic, then you can add this as an RLSA audience and see much further beyond what is offered in GA’s Multi-Channel Funnel report. You will be able to see exactly which paid search keywords were uplifted by those that had previously visited the site through organic, and by how much. Again, this can go beyond path to conversion, and can be used to see visitor paths that did not lead to conversion, to decide at what stage they dropped off, and crucially, ‘why’. It may be that the advertising message needs to be more cohesive across marketing channels. Furthermore, you can apply positive or negative bid adjusters to your audience lists of people who have previously visited the site through a different medium, and indeed, how many times they have previously visited the site. This turns attribution analysis into something actionable. What else do you predict for paid search this year? The paid media landscape will become much broader. Thinking in this creative way is becoming just as essential as the methodical and analytical skills that are the hallmark of a good paid search specialist. I expect this broadening of the paid landscape, and hence the skillset required, is expected to continue. There are more and more content promotion platforms, such as Outbrain, which use PPC models to become more integrated into traditional PPC services. As a result, we would expect in 2016 to see a lot more collaboration between paid search and content marketing divisions. This will again lead to an expansion in the skills required from traditional paid search. Overall, it shouldn’t be long before the terms ‘PPC’ and ‘paid search’ become archaic, and the term ‘paid media’ becomes wide spread across the industry. Enjoyed this post? Sign up to our newsletter to make sure you don’t miss out on any updates or contact us today.